Vinyl Wall Mural Golden Gate, San Francisco, California, USA. San Francisco is smaller than you thought it was – the population is still under a million of people. And we're talking about the USA here, so it really isn't all that impressive, given the fact that the city could rival New York in terms of popularity. But it is exactly its laid back character and charming atmosphere that allowed San Francisco to find its place among the most desirables destinations in the world. Vinyl Wall Mural A panoramic shot of San Francisco, taken from Treasure Island. Vinyl Wall Mural The Painted Ladies of San Francisco, California, USA. 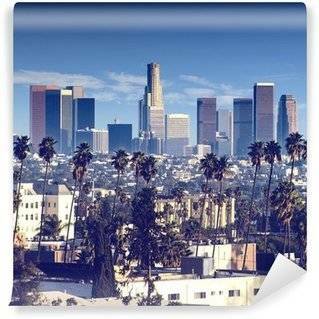 Wall murals depicting the San Francisco themes are very versatile, and as such can be adequate for a number of purposes. 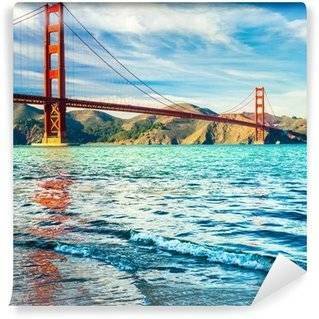 The most popular motif concerning San Francisco is the one with Golden Gate Bridge. Of course, even there you can find a lot of variety – you can pick the bridge during the sunset, dawn, dusk... not to even mention different seasons or monochromatic versions of all the aforementioned options. There is enough of a choice to make your head spin, and that's just the beginning – in addition to the San Francisco bridge, there are also graphics depicting Alcatraz or the famous trams. That's why San Francisco patterns can be called versatile and diverse – all the different kinds of iconic objects in and around San Francisco carry a different vibe and will influence your interiors in a different way. For a cheerful, stylish twist, we advise using wall murals with San Francisco trams, while for a more dramatic, serious vibe, the Alcatraz wall mural would be a better choice. It's a stable trend that the smaller and more humble objects are able to compete with grand, noisy monuments. 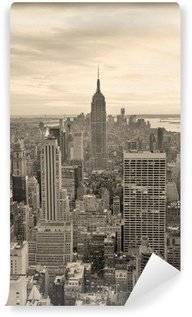 The fact that the photographs with San Francisco are equally or even more popular than the ones depicting, for example, New York city, is surprising and fascinating at the same time. People around the world are starting to appreciate the smaller things more than loud, heavily-advertised ones. That's why a peaceful, tiny tram on the streets of San Francisco is able to compete with the Empire State Building – and just compare the level of exposure each of them got in the movies, for example. That's something to think about when designing your interiors. 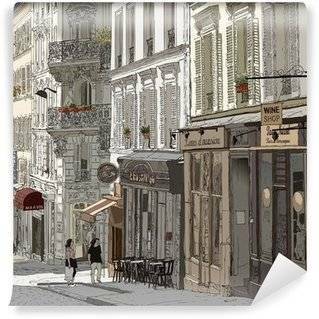 San Francisco wall mural will allow you to achieve a stylish, laid back and charming vibe while avoiding the mainstream character some tend to dislike. Therefore, San Francisco wall murals are awesome alternatives to New York or Paris wall murals, while being just as influential in terms of interior design appeal. San Francisco themes are a part of a bigger set of motifs depicting famous cities from all around the world – including Paris, New York or Los Angeles, just to name a few. Therefore, if you're a fan of such inspiration, we advise you also check out other of our graphics, to be sure which city works best for your house and your tastes. Who knows, maybe you won't be able to settle for only one city and actually get yourself a collection of several different? Each is unique and deserves to be immortalised on your wall!